☜ هذا البرنامج Banner Maker Flash برنامج خاص لعمل إعلانات (بنرات) فلاشية بصورة إحترافية و بكل سهولة بسرعة كبيرة ومظهر محترف بإستخدام برنامج Banner Maker Flash. بإستخدام واجهة البرنامج يمكنك إنشاء عناوين فلاش رائعة في دقائق قليلة. ☜ هذا البرنامج قوي ومتوافق مع جميع إصدارات الويندوز . Each designer sites, offer him a wonderful program today to make flash banners with professionalism and easilySWF Easy is a Flash banner maker suitable for both beginners & experts. 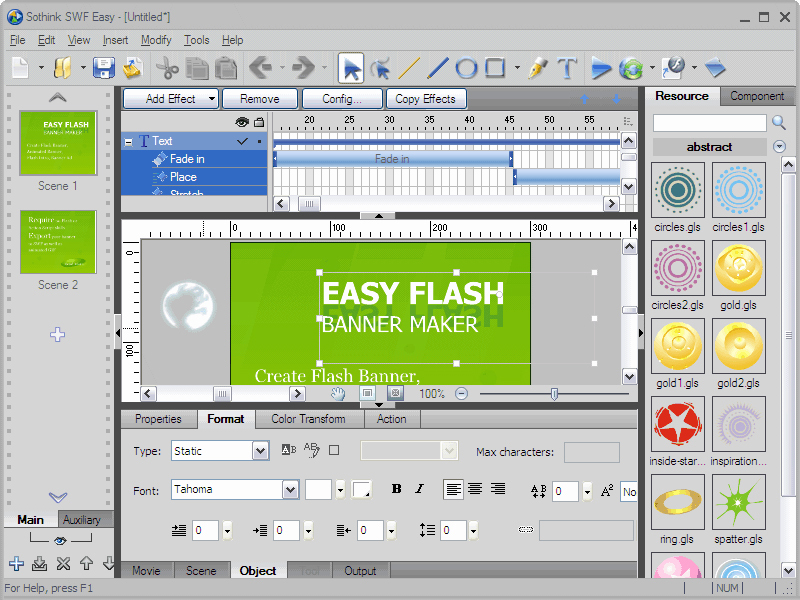 For beginners, it provides multi-style templates, hundreds of resources, 60+ animation effects with which you can finish a Flash banner by clicks. For experts, it provides full customization features that totally exceed the common online banner generators. SWF Easy can also extract resources from SWF files and you can reuse the resources to simplify your design work. وللمراقب على اضافته الكراك ..